Back in August I was given a glimpse of the developing crisis situation in Beaumont Hospital when at the invitation of a member of staff I was taken on a tour pointing out the various stresses the system was being put under. The bad situation in A&E goes without saying but on that particular day the main issue brought to my attention was a situation where increasingly, older people who are due for procedures are forced to spend longer than is necessary in hospital day wards as a result of the succession of cuts to home helps and social care packages. They are simply not in a position to go anywhere, particularly if they have no family in a position to look after them. It is estimated that some 800 bed spaces in our entire hospital system are taken up in this manner. However in some instances there are not even beds availabl. As was pointed out to me on my visit some were left in chairs for days. The word ‘acopia’ is being used now to describe the situation that older people are finding themselves in. Acopia was described to me as the vulnerable mental and physical state older people can be in after an injury or illness or medical procedure that appears like a state of confusion but can be wrongly looked on as the first signs of dementia, when in reality a bit of care and support has them back on their feet. However, the absence of such care means that the people concerned may not recover their independence. The knock on consequences for Beaumont and potentially other hospitals is increased waiting times for people awaiting procedures because the bed spaces are taken up indefinitely by people who do not need to be there. The 2,000 beds taken out of the hospital system across the state is another root cause. When I heard about the crisis point reached in Beaumont over the Christmas period when they could not receive anybody into A&E it came as no surprise. Besides A&E the Sunday Business Post also recently revealed that Beaumont was also now refusing to even put public patients on their waiting lists such are the waiting times. 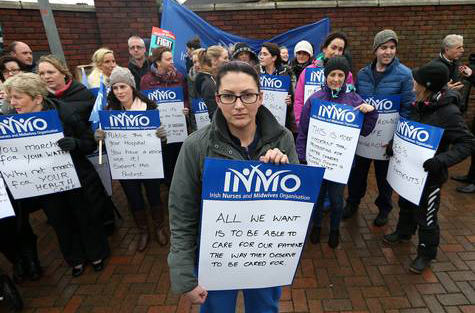 So the work to rule announced by members of the INMO for the 27 January as well as the recent lunch time protest are entirely justified initial steps to begin to put management and the government under pressure. It has already been demonstrated in recent months that organised protest and struggle can force results and we desperately need to mount a struggle on this issue. Such a struggle can be linked with the demand for a reversal of all the cuts that been imposed in the last six years and the creation of a top quality public health service that is funded by taxing the super-rich.